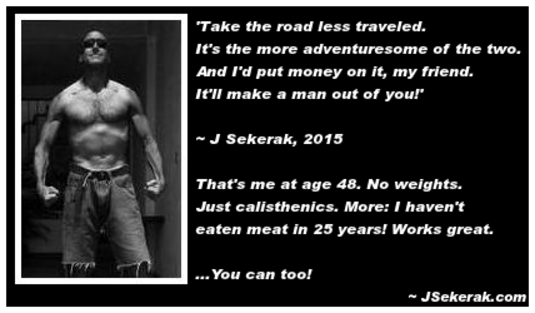 Jeff Sekerak - Body-weight Workouts: 7 Good Reasons They're SUPERIOR To Weight Lifting. Body-weight Workouts: 7 Good Reasons They're SUPERIOR To Weight Lifting. Having to pay for a gym membership: Then, having to take the time to drive to the gym, just to get in a workout. I can't tell you the number of gym trainers who've told me: 'Most of my new clients come to just a few training sessions. Then they disappear - never to be seen again!' And those clients are still being billed. I'm betting at least PART of the reason they disappear, has to do with the inconvenience of getting to the gym in the first place. There may be a bit of 'buyer's remorse' too. Having to purchase and deal with weights: Not only can these be pretty expensive. But they take up space. They often end up just 'collecting dust.' And, if used incorrectly, they can lead to serious injury. It's a bad combination, overall. Having to split cardiovascular and weight-lifting sessions: This takes twice as long as an efficient body-weight fitness routine. And I can tell you from experience: The results from weight-lifting - in terms of overall fitness - are nowhere NEAR what you get from a good, tough body-weight workout. Having to focus on one body-part at a time, during workouts: This not only unnecessarily lengthens your workout. It wastes time. And, it doesn't engage your core even HALF as well as a simple body-weight workout. One that includes for example, squats, push-ups, pull-ups and the like. Try doing these exercises (one set after another) for a half-hour. You'll see what I mean, VERY quickly. More risk of injury lifting weights, than with body-weight exercise: I've yet to meet a serious lifter who DIDN'T suffer some chronic injury - usually joint or tendon related. I've yet to meet a body-weight workout devotee, who suffered ANY serious injury. 1) No gym required: A body-weight workout can be done literally anywhere you can stand. 3) Saves hours of time by NOT having to separate cardiovascular and weight sessions: Do a good, tough body-weight workout. You'll get a great endurance (and fat-burning) workout. You'll get a great strength-building workout too. And you get them BOTH done in a single session. 4) Greatest circuit-training method known to Man: There's no need to waste time 'switching stations' during a workout. Complete one set of a specific exercise, like push-ups. Then simply jump up. Do a few jumping jacks to loosen the muscles. And move immediately into your next set - of squats or crunches, for example. 5) Total flexibility and control: You can make body-weight workouts fairly easy to start. Then you can progressively make them as tough as humanly possible. If you dedicate yourself to tough, body-weight workouts - and do them for just a half-hour to 40 minutes a day? You'll soon transform yourself into a lean, well-muscled, attractive 'fitness machine.' I'm living proof. 6) Almost zero risk of injury. These are just a few benefits that make body-weight workouts, in my experience, FAR superior to lifting weights. I've tried both for extended periods. Yet now, after NOT having lifted weights for years - I'll never go back. I'll never give up the simplicity, convenience, and flexibility of equipment-free workouts. And I'll never pick up a weight again. Do a set of jumping jacks. Now drop down and do a set of push-ups. Do them on your knees if you're not great at standard push-ups, to start. Now do a set of body-weight squats. Follow with a set of abdominal crunches or sit-ups. Now jump up and do another set of jumping jacks. Then repeat the entire cycle. Do this as many times as you can, with AS MUCH INTENSITY as you can. Go for 15 minutes if you're a beginner. Do sets of 30 to 50 repetitions for each exercise. If you're at a greater fitness level, go for 50 to 100 repetitions of each exercise. And make your workouts last 30 to 60 minutes. Do this workout daily. Do it for a few short weeks. Stay consistent. Combine it with a diet rich in plenty of raw plant-foods. And you'll rapidly transform yourself into the fittest 'you,' of your life. Yes, you can add weight-lifting, yoga, or running to your workouts. Yet if you make simple, equipment-free exercises the core of your workout regimen? You'll soon develop a type of power that's unmatched by almost anything else you could do. You'll be fitter, stronger. Fat will 'fly' off your body like never before. And you'll have more mental toughness than 9 of 10 people you meet, anywhere on earth. Body-weight workouts have that effect on you. As they pull the very best out of you, with each workout. Copyright 2015, J. Sekerak. All rights reserved. Consult your doctor - not to mention your good old common sense! - before engaging in any diet or fitness plan. I like 'common sense' better, btw.